Sponsorship and Funding: What is the price of sport? What price do you charge for sport events or programs? Sport and recreation clubs are often faced with the perplexing problem that the actual cost of providing sport programs is significantly greater than the revenue gained from program users (participants). A mind set on the part of club administrators that fees need to be kept to a minimum for fear of losing club members to other clubs. A concern on the part of club administrators to keep prices low to assist sections of the club membership who are “doing it tough” financially. An expectation on the part of sections of the community that participation in sport and recreation should be low cost. This is often coupled with an undervaluing of the importance of sport and recreation services. A lack of community understanding of costs associated with running a sport club. For example, users of a Football club might just see ‘a field’ whereas club administrators see ‘a playing surface’ that requires significant investment in turf management, irrigation equipment, mowing machinery, line marking, fence upkeep and goal post fixing. Organisations are able to muster the skills and effort to submit government funding applications. The application process can be quite daunting despite the help and assistance provided by funding agencies. Organisations have events and programs that serve as a useful promotional vehicle for potential sponsors. The reality for most grass roots organisations is that meaningful amounts of money from sponsorship are very hard to achieve. Organisations have sufficient energy and manpower to organise fundraising programs such as raffles, functions and merchandising. Slow dilapidation of the clubhouse and other facilities. The unpleasant visit to the toilets is a good example. 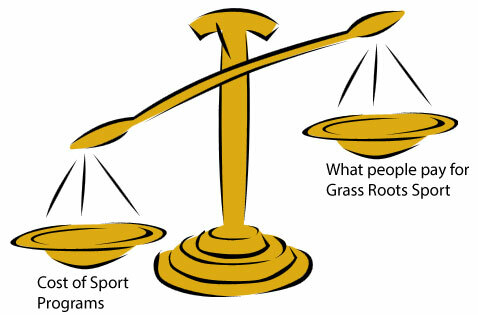 In the final analysis, sport club committees are faced with difficult decisions in regard to setting fees and charges. There is a difficult balancing act between higher fees that allow for better service delivery and lower fees that increase price competitiveness. It is always worth remembering, however, that sport participants generally want an enjoyable experience above all else.